In this next ‘Photo of the Week’ we will be looking at research investigating and predicting the impacts of non-native fish parasites, from the hosts to ecosystems. This research is being carried out by BU’s Josie Pegg. Almost all living things have parasites. When species are moved from their natural habitat and introduced into a new habitat, they often bring their parasites with them. Some of these parasites will be lost, but some may be transferred to new hosts. Josie’s research focuses on the impact of non-native parasites on native fish species in the UK. The effect of parasitic infection varies between species and individuals. Parasitism may cause pathological damage and modifications to host behaviour, fitness and energetics. Josie’s research uses stable isotope analysis and food web topology to investigate if, and how, infection by non-native parasites alters naïve fishes’ feeding behaviour and the consequences for the host and the aquatic food web. 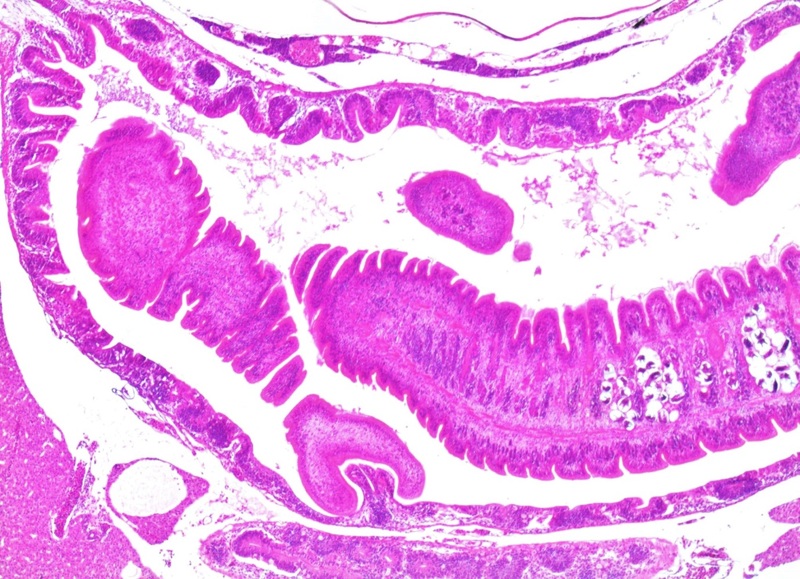 This image is a stained histological section of the gut of a small carp with the ‘Asian tapeworm’ Bothriocephalus acheilognathi attached inside it.